The Nittany Lion, who was the Texas and Central Region winner of the National Wrestling Hall of Fame’s Dave Schultz High School Excellence Award in 2014, won his third NCAA championship on March 23, defeating Kollin Moore of Ohio State. The 5-1 finals victory at 197 pounds was Nickal’s 30th of an undefeated senior campaign that included 18 pins, three tech falls and six major decisions. The Hodge Trophy, presented annually by ASICS Wrestling, was created in 1994 by WIN founder Mike Chapman, who was honored by the Hall of Fame as its Outstanding American in 2007. It is named in honor of Dan Hodge, a Distinguished Member inducted into the National Wrestling Hall of Fame in the Charter Class of 1976. The former University of Oklahoma wrestler won three NCAA titles (1955-57), never allowed a takedown in his career and pinned 36 of 46 foes. Hodge is still the only wrestler ever to appear on the cover of Sports Illustrated. In a year that featured four outstanding finalists for the award, known as “wrestling’s Heisman Trophy,” Nickal won the honor over a senior teammate Jason Nolf, also a three-time NCAA champ who had very similar stats as Nickal. The other two Hodge finalists were Rutgers’ senior Anthony Ashnault, who was the New Jersey winner of the DSHSEA in 2013, and Cornell sophomore two-time national champ Yianni Diakomihalis, who was the New York winner of the DSHSEA in 2017, won NCAA championships at 149 and 141 pounds, respectively. “It’s something I’ve wanted since I was in high school and I first found out about the award,” Nickal said. “I’ve tried to go out and do what the Hodge symbolizes, going for the pin and scoring as many points as I can. The Allen, Texas, native did just that this year, dominating opponents in college wrestling’s second heaviest class. Nickal finished with a 68-match winning streak and a reputation as a wrestler who could pin an opponent from any position. His most memorable fall came against 2016 champ Myles Martin of Ohio State at the 2018 NCAAs. With 30 seconds left in the first period of the 184-pound final, Nickal dramatically flipped Martin over and pinned him with an elevator series shortly after the Buckeye put Nickal on his back. The pin sealed the team title for the Lions over Ohio State in Cleveland last March. Of the 51 total ballots, Nickal finished with 37 first-place votes from the Hodge Trophy Voting Committee. Nolf was second in Hodge voting with 10 votes from the committee made up of each past Hodge winner, national media, retired college coaches from each region and a representative of each national wrestling organization. 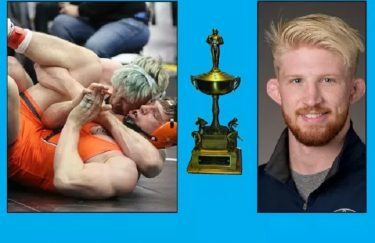 Four voters cast ballots for a Hodge Trophy to be awarded to both Nickal and Nolf this year. Criteria for the Hodge include a wrestler’s record, number of pins, dominance, and quality of competition. Past credentials, sportsmanship/citizenship and heart are secondary criteria used when two finalists have similar stats. Nickal had the most pins of the four finalists with 18. Nolf finished with 15 falls, while Ashnault had 8 and Diakomihalis 7. Nickal put up bonus points in all but 3 of his 30 matches for a bonus-point percentage of 90 percent. Nolf’s bonus-point percentage was 87 percent, while Diakomihalis and Ashnault were both at 58 percent. Two of Nickal’s 37 first-place ballots came from the on-line fan vote on WIN Magazine’s website. Of the nearly 28,000 unique votes cast over a four-day period during the week following the NCAAs, Nickal had 13,892, Ashnault was second with 7,828, Nolf had 5,251 and Diakomihalis ended with 933. Penn State coach Cael Sanderson, a Distinguished Member inducted into the Hall of Fame in 2011, is a three-time Hodge winner (2000-2002). Nickal is the third Nittany Lion under Sanderson to win wrestling’s Heisman, with David Taylor (2012, 2014) and Zain Retherford (2017, 2018) each having won the award twice. Taylor was the Ohio and national winner of the DSHSEA in 2009 while Retherford was the Pennsylvania, Northeast Region and national winner in 2013.